Dr Lucy Burr is the Cystic Fibrosis (CF) Centre Director at the Mater Hospital, Brisbane, where she practices as a full time Respiratory and Sleep Physician. She is also a Senior Lecturer at the University of Queensland and has an active role in teaching medical students. Lucy leads the Cystic Fibrosis Research group in the Mater Respiratory, Infectious Diseases and Thoracic Oncology (RIO) Research unit, with a team of 8 clinical and scientific researchers. Lucy is the author of over 14 scientific publications with her research currently focused on improving the care and outcomes of patients with both Cystic Fibrosis and bronchiectasis — multi-system inflammatory diseases with prominent effects on the lung. She has been interested in bronchiectasis since her PhD, where she investigated the impact of infections caused by the bacterium P. aeruginosa in individuals affected by this disease. A major outcome of her research has been the demonstration of the role of manipulating bacterial communication in the treatment of bronchiectasis. Her group is currently expanding this research by investigating the microbiological impact of treatments and disease in Cystic and non-Cystic Fibrosis bronchiectasis. This research is particularly focussed on assessing the impact of intestinal dysbiosis and the effect of altering the gut microbiome to influence and improve pulmonary outcomes. Lucy trained as a medical doctor in the UK at Kings College London, emigrating to Australia in 2004. She has worked as a doctor in the Northern Territory and South East Queensland, settling in Brisbane where she completed her specialist training in Respiratory and Sleep medicine, and PhD studies with the University of Queensland. 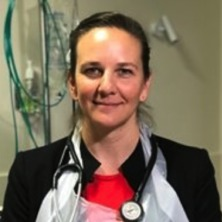 Lucy is currently the Deputy Convenor of the Respiratory Infectious Diseases Special Interest Group of the Thoracic Society of Australia and New Zealand, and a core member of the Australian Bronchiectasis Consortium. She is a current Betty McGrath Research Fellow. Visser, Simone, Allan, Heather, Burr, Lucy, Chang, Anne, Holmes-Liew, Chien-Li, Hunter, Cameron, Jackson, Dan, King, Paul, Maguire, Graeme, Middleton, Peter, Smith, Daniel, Thomson, Rachel, Waterer, Grant, Wong, Conroy and Morgan, Lucy (2017). The Australasian Bronchiectasis Registry - Early Steps in Mapping the Impact of Bronchiectasis in Australia and New Zealand. In: Respirology. The Australia & New Zealand Society of Respiratory Science and The Thoracic Society of Australia and New Zealand (ANZSRS/TSANZ) Annual Scientific Meeting, Canberra, Australia, (61-61). 24–28 March 2017. Burr, L., Rogers, G., Taylor, S., McGuckin, M. and Serisier, D. (2015). Sub inhibitory erythromycin reduces the expression of key P. aeruginosa virulence determinants in non-CF bronchiectasis subjects. In: Thoracic Society Australia New Zealand Australian New Zealand Society Respiratory Science Annual Scientific Meeting 2015, Queensland Australia, (29-29). Mar 27-Apr 01, 2015.